St Giles Gin was launched in 2017 by Norwich Dry Gin Company after the founder, Simon Melton, was inspired by the gins he tasted while travelling the world as a professional diver. The gin is distilled in-house in Norwich in a German 400L copper still, named Anna after Simon's first daughter. It is created using over 20kg of fresh, local fruit and combines the distillation of rhubarb with the infusion of raspberries. St Giles Gin is named after the historic St Giles area of Norwich where the company was established, as well as referencing the St Giles area of London which was at the heart of the gin craze in the 18th century. 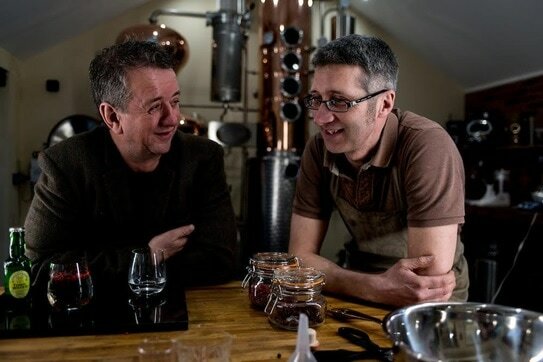 "Pete made well over 80 different gins, and we enjoyed lots of tasting sessions, before we settled on the recipe for St. Giles Gin." ​Also try St Giles Gin an St Giles Divers' Edition Gin (57% ABV). For more flavoured gins try Cuckoo Sunshine Gin and Pinkster Gin (raspberry).